Potter Talk: Harry Could Speak Parseltongue. Would you too? Harry Could Speak Parseltongue. Would you too? The first sighting, or mention should I say, of Harry Potter talking to snakes takes place in the Sorcerer's Stone. 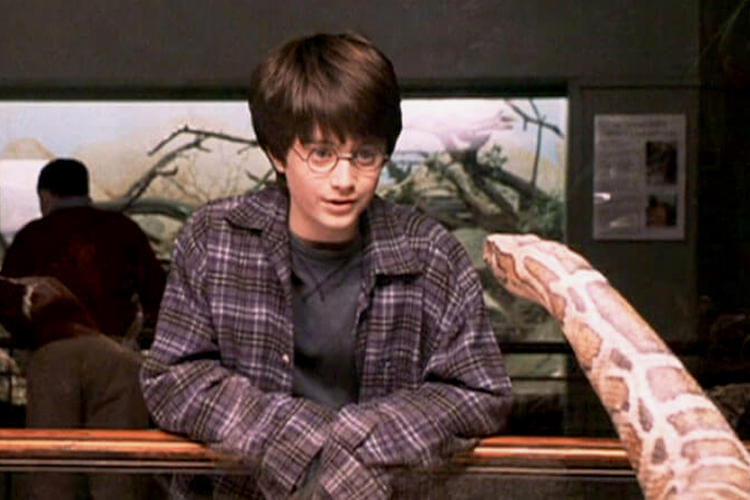 Potter empathizes with a boa constrictor held in captivity at the zoo, where the Dursley family is celebrating DudleyWudley's birthday, and he magically lets it out of its environment. This is one of several monumental moments we reckon that Potter is more than a regular boy, and perhaps it's suspecting his ability to speak to snakes his part of his wizarding abilities. It isn't until the second book Chamber of Secrets we discover what it means to be a parseltongue. The definition of Parseltongue. Parseltongue is the language of snakes...It is, in the common mind, associated with Dark Magic, and those possessing the ability to speak it ("Parselmouths") are very rare. Similar to the Slytherin connection Potter shares with Riddle, as a fellow Gryffindor would I want to speak the language of a lion? Would you want to speak the language of an eagle if Ravenclaw, badger if Hufflepuff? Like Potter I don't come across lions on a regular basis, only when I am at a zoo or animal conservatory, so this gift wouldn't be a hindrance on my normal life...But how unexciting would that be?! If you could speak an animal's language, which one would you speak? What do you think that language would be called?